Halloween fans crossing off the days until October 19 need to circle a few more dates on their calendars. Longtime series producer Trancas International Films announced on Monday that the 40th anniversary Halloween convention, “Forty Years of Terror,” is set for Oct. 12-14 at Pasadena Convention Center, just blocks from where John Carpenter’s original film was filmed in 1978. The fourth official gathering of fans, cast, and crew since 2003, “Forty Years of Terror” is set to be the biggest convention in series history, coming one week before the eleventh film – a direct sequel to Halloween ‘78, and again starring Jamie Lee Curtis – bows in theaters. Pasadena has hosted the convention – celebrated every five years – since 2003. For the 2018 show, Trancas and fan favorite con promoters HorrorHound will take over an expanded area of the Convention Center for, “more exciting vendors – including notable Halloween licensees – and a number of not-to-be missed events, such as a special Horror’s Hallowed Grounds filming location tour, special gallery offerings, cast Q&As, exclusive H40 and Halloween merchandise offerings” and professional photo ops. Guest announcements for the 40th anniversary convention will trickle out in the coming weeks, although fans will focused on two names: Jamie Lee Curtis and John Carpenter. While neither appeared at 2013’s “35 Years of Terror,” it would not surprise anyone to see the pair on stage as part of the promotional blitz for the upcoming sequel. The nine years between 2018’s Halloween and the last film released in the series – Rob Zombie’s Halloween 2 – is the largest gap between entries in the 40-year-old franchise. Historically, fans could always count on a new film within five years of the last. “Forty Years of Terror” marks the first convention held during the year of a new Halloween release. Previous conventions in 2013, 2008, and 2003 occurred in “off” years, but have been well attended by stars of the series. Ticket prices (including VIP packages) will be announced “within the month,” according to Trancas, on the Halloween 40 website. By eschewing the nine(!) sequels separating John Carpenter’s Halloween from the 2018 follow-up, the latter group of filmmakers (which includes writer/director David Gordon Green, writer Danny McBride, producer Jason Blum, and Carpenter himself in an executive producer role) have freed themselves from four decades of the slasher series’ tangled canon. Audiences are simply asked to forget the events of Rob Zombie’s 2007 remake (and its lesser sequel), the “Cult of Thorn” arc that link Halloween’s 4-6, and even the well-received 20th anniversary Halloween H20, itself a sequel that ignored the events of four prior films. That’s not easy to do, though it should be noted that fans have likely erased their memories of H20’s follow-up, Halloween: Resurrection, in which series villain Michael Myers faced off with a karate-kicking Busta Rhymes. Yet, by making the new Halloween a direct follow-up to the 1978 original, Green and company are raising questions that will deserve answers once the film bows on October 19. Chief among them: How was Michael Myers captured following his disappearance at the end of the first film? For those who haven’t gone back recently, in the climactic moments of Carpenter’s Halloween, Myers was shot by his psychiatrist, Sam Loomis (Donald Pleasance), and fell from the second-floor balcony of a home in which he’d cornered Jamie Lee Curtis’ Laurie Strode. However, when Loomis goes to inspect the body he finds Myers gone, setting up the first sequel, which picks up at that very moment. The 2018 Halloween trailer opens with a pair of investigative journalists visiting Myers in a prison/asylum. How he ended up there? Only the filmmakers know, for now. On that note, how will the sequel explain Loomis’ fate? Pleasance’s character is referenced in the trailer, and if he wasn’t killed at the end of 1981’s Halloween II (again, it’s been wiped from canon), the new film should reference what became of Loomis. Judging by the trailer’s approach to Laurie Strode – she’s armed and waiting for Myers to escape – it appears the one-time “final girl” has assumed Loomis’ role as the series’ Van Helsing, the hunter/harbinger, prepared to face her mortal enemy while warning the rest of fictional Haddonfield, Illinois of their approaching doom. For fans who still hold the sequels (or at least, some of them) close to their hearts, they can take comfort in the fact that this new Halloween is peppered with homages and Easter eggs they’ll surely recognize, if they’re paying attention. Myers’ escape in the sequel is the result of a yet-to-be explained bus accident. 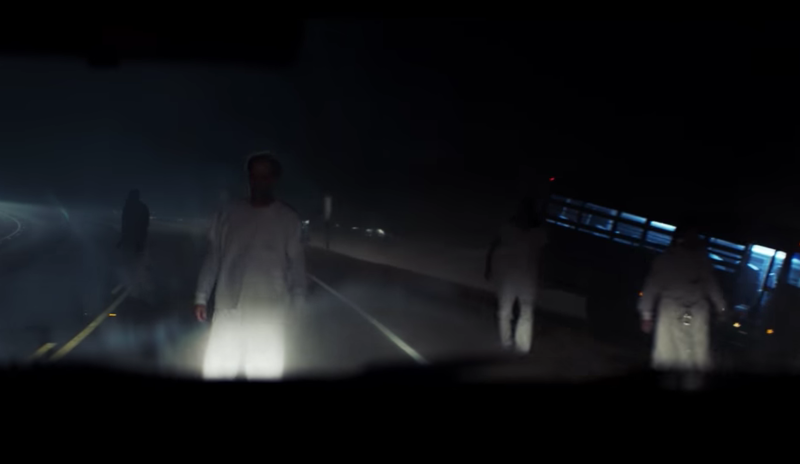 The trailer shows a family in their car braking suddenly when the killer and his fellow asylum patients are wandering in the road. The scene bears resemblance to the opening of the 1978 film, in which Pleasance’s Loomis and Nancy Stephens’ Nurse Chambers come upon the escaped patients of Smith’s Grove Sanitarium. While Laurie Strode’s connection to Michael Myers initially felt forced in the first Halloween sequel – the two are brother and sister, with Laurie put up for adoption after he committed murder as a 6-year-old – the familial bond went on to become a critical thread in chapters 4-8 and Zombie’s films. Unless there’s a curveball coming in the finished film, this is just another way Halloween’s writers are tipping their caps to the series’ fans. In the trailer, Myers is seen terrorizing one of the investigative journalists inside a gas station restroom. Fans of the series will immediately be reminded of a scene in Halloween H20 in which Myers stalks a mother and daughter in a restroom, only to steal the keys to their car. The scene could also be a reference to Zombie’s Halloween, in which Myers acquires his familiar coveralls in a to-the-death fight with Ken Foree’s Joe Grizzly. Another trailer callback to the first Halloween occurs when a pair of trick-or-treaters run into Myers on the sidewalk. The scene in the trailer (at 2:00) even makes use of Carpenter’s original score, and mirrors the moment in 1978’s Halloween when young bully Ritchie Castle (Mickey Yablans) runs into Myers. A similar scene occurs in Halloween II when a young boy carrying a boom box (Lance Warlock) accidentally crosses paths with Myers. 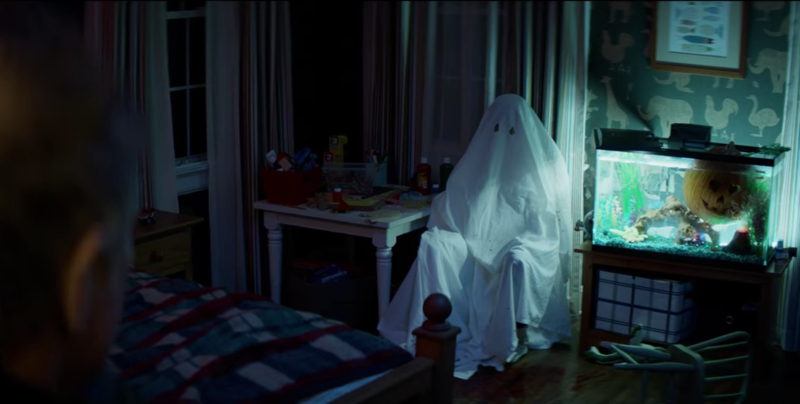 One of the iconic scenes in Carpenter’s Halloween sees Myers approaching his victim in the guise of her boyfriend, wearing a “ghost sheet” with two eyeholes cut out. The trailer shows a similarly dressed shape waiting in a chair as Will Patton’s cop surveys a bedroom. We’ll have to wait until October 19 to see who’s under the sheet. 6. Silver Shamrock is Back! The decision to abandon the Michael Myers character and go with a brand new storyline for 1982’s Halloween III: Season of the Witch is one that flummoxed critics and audiences back in the day. Those in line to see babysitters stalked by a killer were instead treated to a somewhat incomprehensible plot to murder the children of the world using Silver Shamrock brand Halloween masks fitted with microchips and pieces of Stonehenge. It’s a Twilight Zone-meets-Body Snatchers plot that never quite comes together and derailed the franchise just as Friday the 13th and Nightmare on Elm Street would begin to dominate the 80s slasher scene. Decades later, Season of the Witch has found its cult audience, and fans looking closely at the just-released trailer will notice — for a split second at 2:07 — children running in fear wearing the classic Silver Shamrock masks. What other Easter Eggs did you spot in the trailer? Let us know and revisit the series with Now Playing Podcast’s Halloween retrospective. This marks the final entry in The Corn Connection series, and much like the Children of the Corn films, it’s going out with a whimper. 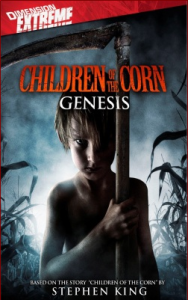 Now Playing Podcast released its final review in the Corn retrospective on Tuesday, and after scraping the IMDB page for Children of the Corn: Genesis, I was able to find just one “star” who appeared in another film covered on the show. Sure, there are actors you’ll recognize, like Billy Drago from The Untouchables and Cyborg 2. But I don’t see a Cyborg retrospective in Now Playing’s future. Nor do I see the hosts turning to television for The Office retrospective, just so they can reference lead actress Kelen Coleman, who guested in a few episodes as Dwight Schrute’s love interest, Isabel. The only true connection in this final Corn film is actor Duane Whitaker, who plays the character Pritchett. If the name doesn’t ring a bell, the face will. Whitaker’s career is loaded with various villain and hillbilly roles, most notably 1994’s Pulp Fiction, where he played the shop owner who holds Bruce Willis and Ving Rhames prisoner until Zed shows up. You know what happens next. He’s also shown up in a slew of genre pics, everything from Feast to Tales From the Hood to From Dusk Till Dawn 2: Texas Blood Money. But if you want to find Whitaker in the Now Playing Podcast archives, you’ll find him in the Halloween, Rob Zombie and Texas Chainsaw Massacre retrospectives. In Zombie’s Halloween 2, he played one of the hillbillies who gets killed by Michael Myers in a field after calling out the killer for trespassing. It was brutal. Whitaker also played Dr. Bankhead in The Devil’s Rejects, another Rob Zombie picture; and one of his earlier horror roles came in 1990’s Leatherface: The Texas Chainsaw Massacre III. So that’s that. Nine entries up, nine entries down, a few dozen connections made to the Now Playing Podcast archives. Mission accomplished. Thanks for reading! Did we miss anyone? If you spot an actor or actress with a connection to Now Playing Podcast leave a comment and help a fellow listener!